Endurance – A Year In Space, A Lifetime Of Discovery by Scott Kelly. Published by Alfred A. Knopf, October 2017. When Scott Kelly decided he was going to write a book he contacted Tom Wolfe, author of THE RIGHT STUFF, the book that inspired Kelly to become an astronaut. Kelly asked Wolfe how he should begin. “Begin at the beginning,” was Wolfe’s reply. And so Scott Kelly begins with his life growing up in New Jersey as the twin of his astronaut brother Mark. His parents, both liquor addicted police officers, were still inspirations to the burgeoning astronaut. Especially his mother, who was able to set goals and meet them, even at the hands of an abusive husband. Scott was an uninspired student through most of his high school years, and then he picked up a copy of Wolfe’s book, which is the story of the original Mercury astronauts. He was hooked. Kelly knew his grades would never get him into the Naval Academy at Annapolis, but they were good enough to get him into the Merchant Marine Academy, which was good enough to get him into the Navy. He became a pilot, and that led to becoming a test pilot, and that led to NASA. His first Space Shuttle mission was in December 1999, when he was pilot of Discovery STS-103, an eight day service mission to the Hubble Space Telescope. In 2012 Kelly was selected for a 340 day mission aboard the International Space Station, a mission that began in March 2015 and ended in March 2016. He retired in April of the same year. 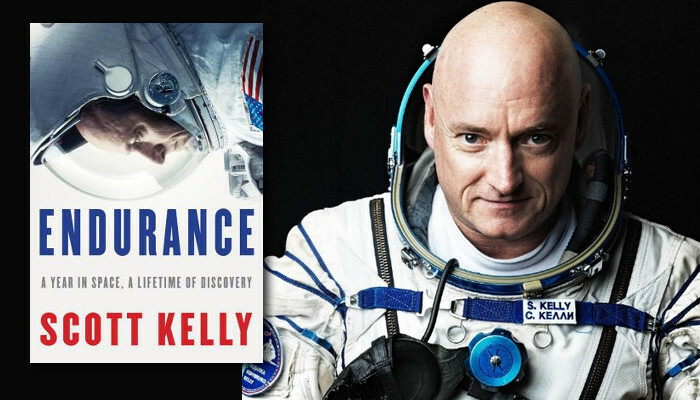 Kelly has written a very engaging book about his life and his life in space, and the havoc that space travel wreaks on a human body. Kelly writes how his first marriage ended in divorce, hinting that marital infidelity on his part might have been one of the causes of that failure. Kelly is at his best when he writes about his life on earth. From a failing, uninspired student to becoming a paramedic, to becoming a test pilot and then an astronaut, he has written an inspiring story. It’s not an ‘if I can do it, you can do it’ type of story. Rather, it’s a story of overcoming the obstacles in your path and achieving your goals. His writing of his life in space is also quite interesting. I think we all realize how dangerous space travel can be, but I never realized how much of a toll it takes on an astronaut’s body. It affects their vision. It affects their neuromuscular structure. Too much inhalation of elevated carbon dioxide can lead to the bends, the same condition that afflicts divers. We now know that, thanks to medical tests performed on Scott and his astronaut twin brother Mark, that it also affects their DNA, as Scott’s is now slightly different than Mark’s. The research into how his year in space affected his body will go on for years. Scott Kelly has written a very good memoir, with just enough tension to make readers feel like they’re riding a missile into space alongside him. It also reminds us that, with enough hard work, we can attain the goals we set for ourselves.